Soybean prices tumbled more than 2% Friday morning. President Donald Trump announced the US will move forward with a 25% tariff on $US50 billion worth of Chinese goods. The move stokes fears that China will hit back with tariffs on soybeans. Soybeans slid Friday morning as the Trump administration hit the world’s biggest importer of soy with tariffs on tens of billions of dollars worth of goods, a move Beijing has said it will push back on with its own taxes on major American agricultural goods. 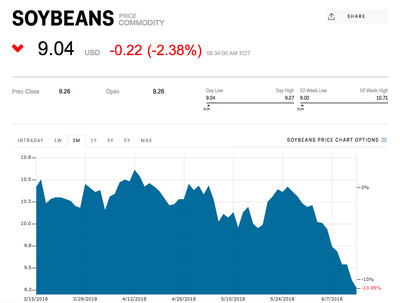 Soybeans were down 2.38% to $US9.04 a bushel at 8:45 a.m. ET. Futures for November delivery fell as much as 1.9% on the Chicago Board of Trade to the lowest level in nearly a year. President Donald Trump said early Friday the US will go through with threats to impose a 25% tariff on $US50 billion worth of Chinese goods. The list of targeted goods includes technology products, especially those that are part of Beijing’s Made in China 2025 initiative. Within the hour of the announcement, China said it will “immediate take measures of the same scale,” according to Bloomberg. There isn’t an official list of targeted goods out yet, but Beijing threatened earlier this year to impose a 25% tax on US soybeans. Prices of the legume have slid 12.7% since May 29 amid mounting trade tensions between the world’s largest economies. For US soybean traders and farmers alike, any retaliatory response by China targeting the legume would come at a particularly challenging time. And China isn’t the only major importer that the US soybean industry has to worry about. Reuters reported Thursday that Mexican officials are mulling tariffs on $US4 billion worth of US imports of corn and soybeans.